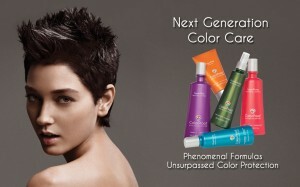 Columbia Md Hair Salon Announces new ColorProof Hair product line. | Best Salon and Spa in Columbia MD! Columbia Md Hair Salon Announces new ColorProof Hair product line. ColorProof EVOLVED COLOR CARE is a complete line of professional luxury hair care products designed and developed by Pureology founder Jim Markham exclusively for color-treated hair. ColorProof delivers the complete range of benefits that color-treated hair demands beginning with superior full spectrum UVA/UVB protection and potent antioxidants to prolong the life and vibrancy of color in each and every product. ColorProof shampoos are formulated with revolutionary super gentle, sulfate-free, salt-free surfactants that explode into a billowy lather while gently cleansing and quickly rinsing clean for long-lasting truly rich color. Nano emulsion technology allows active ingredients to deeply penetrate hair for incredible shine, health, thermal and color protection while Protein Power Complex fortifies, strengthens and repairs. All products contain certified organic botanical infusions of rosemary, geranium, sage, shiitake mushroom and patchouli oil to naturally condition, balance and protect. All this and without the use of parabens, gluten, keratin, MEA, DEA and any other known carcinogens. ColorProof products are also free of phthalates, mineral oil, petroleum and PABA. ColorProof is environmentally friendly with biodegradable formulas and recyclable packaging wherever possible. Each product is 100% vegan, and never tested on animals.